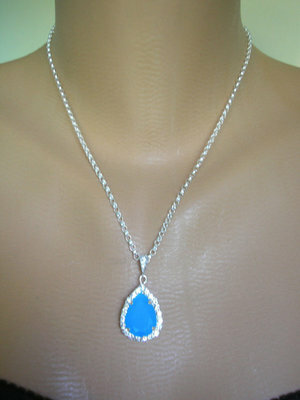 Gorgeous handmade turquoise rhinestone teardrop halo pendant strung on a STERLING SILVER belcher chain. 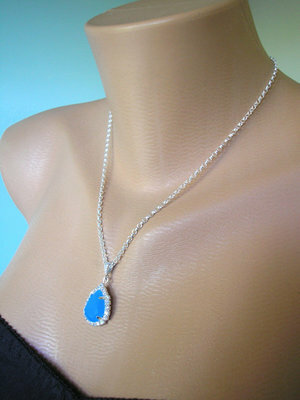 This gorgeous piece is made from a fabulous turquoise glass faceted stone which has been hand set into a teardrop shaped silver plated rhinestone halo bezel. 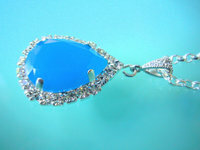 It is joined to the STIRLING SILVER chain by an exquisite silver plated rhinestone covered bail. The rhinestone pendant measures approximately 0.75” x 0.50” (2cms x 1.5cms) and the chain measures approximately 18” (45.5cms) in length. It is secured by a lobster clasp. 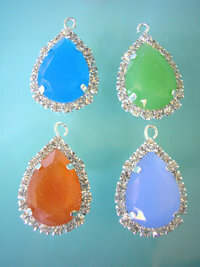 PLEASE NOTE:- This piece is also available with a pale blue, jade green or orange opal central stone - Please see Photo No.4 for colour options. 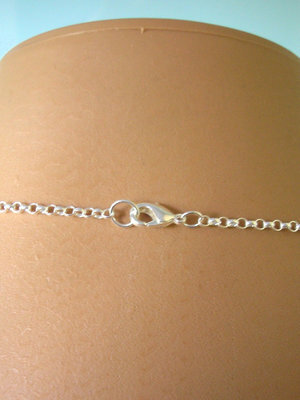 The chain can also be a different length. Please choose your preferences from the drop down menu when ordering.